Home»Blog»BackWPup Campaigns»We celebrate 5 Million BackWPup Downloads! We celebrate 5 Million BackWPup Downloads! We want to celebrate! Because with our backup plugin BackWPup, we reached the incredible number of 5 million BackWPup downloads! This has only been possible because of you, because of your trust and your feedback – and we want to say thank you for that! With a 50 % BackWPup discount on BackWPup PRO till October 31st, 2017! Until October 31st, 2017, you get 50 % discount on our PRO version! Simply put your desired licence into the shopping cart, then, go to the checkout – and you will have BackWPup PRO with all its benefits! The price reduction is already noted in the shopping cart. 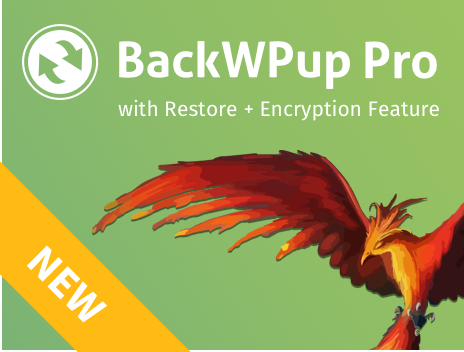 Buy BackWPup PRO with 50 % celebration discount now! Do you want to know what kind of milestones BackWPup made during its last seven years of developing? Are you interested in finding out the differences between BackWPup and other backup plugins? Then, take a look at our blog on inpsyde.com!